Average Adult Fish Size: 39.4 inches / 1 meter! Typical Tank setup: Large rocks, large pieces of wood, caves, and numerous hiding places. All tank items need to be either secured or heavy enough so as not to be knocked over. 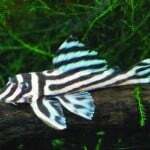 Recommended Minimum Aquarium Capacity: 1000 gallons / 4000 litres! 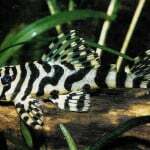 Compatibility: Given the filtration demands posed by the feeding behavior of this species, small fish are probably not a good idea. Tank mates should be 8 inches / 11 cm or larger. 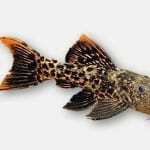 Should not be kept with other pleco type fish unless the aquarium is extremely large (1000 gallons / 4000 litre or larger) and there are numerous hiding places. 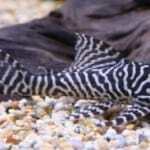 This fish can be very aggressive towards other catfish and plecos. Feeding: A lot! Will eat large quantities of all prepared foods like large pellets, wafers, and sticks, along with chunks of frozen foods, market shrimp, fish filets, and mussels. Vegetable matter should also be included such as cucumber, green beans, lettuce, kale, and spinach leaves. Sexing: In such a large species, examination of the genital area is the easiest method of determination. Breeding: A pond of sufficient size is needed. Other than that breeding information is unknown. 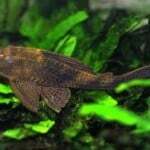 Additional Information: The Adonis is a very large and impressive plecostomus that can be quite aggressive when need be. 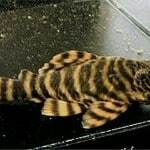 The coloration of a juvenile is much different than a full grown adult. 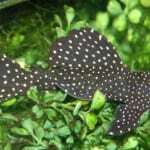 The beautiful spots fade as this fish grows and are fewer in number when full grown. 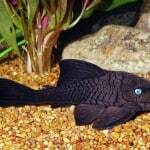 A very large aquarium or pond is needed along with extreme filtration in order to properly keep this large fish.